The ideas we provide are useful only to the extent that they are employed daily to ask essential questions. 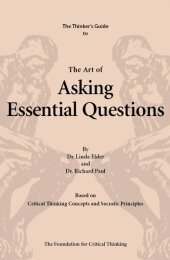 Practice in asking essential questions eventually leads to the habit of asking essential questions. But we can never practice asking essential questions if we have no conception of them. This mini-guide is a starting place for understanding concepts that, when applied, lead to essential questions. We introduce essential questions as indispensable intellectual tools. We focus on principles essential to formulating, analyzing, assessing, and settling primary questions. You will notice that our categories of question types are not exclusive. There is a great deal of overlap between them. Deciding what category of question to ask at any point in thinking is a matter of judgment. Having a range of powerful questions to choose from is a matter of knowledge.